This is well into Forest Service Land, traveling about as far south as one can in a motorized vehicle. 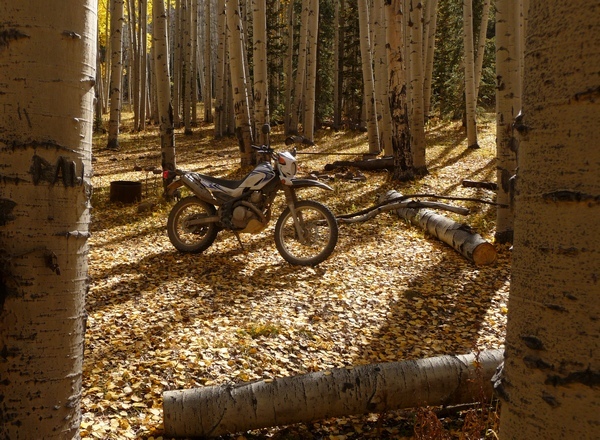 In this shot taken Oct 15, 2010, the aspen leaves carpet the ground, yet many more remain on the trees. the easternmost of those I rode on Friday, Oct 15th. I snapped a few pictures. Here's a view well before one gets to the Forest boundary. 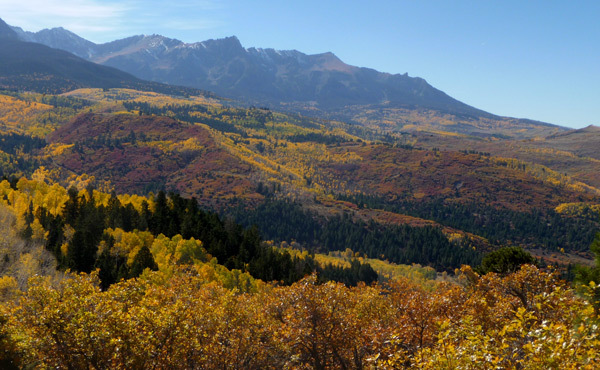 The view overlooks a valley with the aspens and the Sneffels Range behind. The view looks south. That's Mt. Sneffels at the far right. CR 5 heads south out of Ridgway up to Miller Mesa. The first section of road leads to the many homes on the mesa and is maintained year-round. From there, the road is summer only (and I suggest letting the roads dry for a couple days after rain) and winds south until it hits the Forest Service boundary, where it becomes the Forest Service Miller Mesa Road 852. I do have a track of CR 5, but I fear I haven’t yet posted it, because at the time I made it, I couldn’t get all the way to the end of the still-snow-covered road. 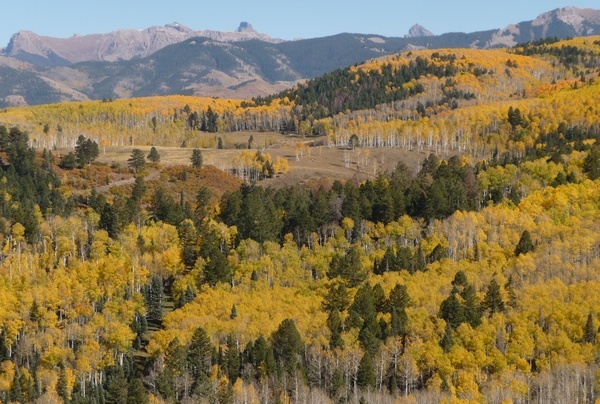 This view, taken not far from where the previous photo was snapped, looks west along the Sneffels Range. The photo above is the only one of the CR 5 series that I needed to take into Photoshop Essentials. It looks so far west that haze was a problem; I improved it a bit. Here's a view looking to the east from atop a ridge. Traveling further south, the road is atop a ridge. There’s quite a view to the east as shown above. One last view looking south. Many of the leaves are down, but many remained. The final photo, above, shows that many of the leaves are down, but there are still more to go. This is taken not terribly far from where the photo at the very top of this post was taken. That’s the Sneffels Range in the background.